When you set your own goals you’ll forced yourself to look inside to find what matters most to your personal and professional life. 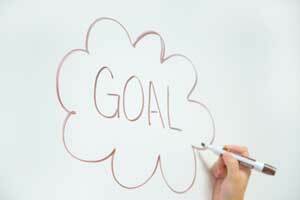 Goal setting lets you determine where it is that you want to go in life. When you know what you want you can focus on taking the steps to make them a reality because you have a vision and the motivation to change your entire life. Studies show that when people effectively set objectives they suffer less from anxiety and stress. An increase in self-confidence helps them to concentrate more fully on their personal and professional lives. Accomplishments of small goals will motivate you for bigger goals. A sense of purpose or mission is a sense of certainty about something and this usually forms a strong belief that propels you to act. If you have a strong sense of purpose then all your life’s resources, such as your talents and education, go towards accomplishing your objectives. A powerful sense of purpose is like a sharp sword; it cuts through lethargy, passivity, and obstacles in your way. Your mission motivates you but it also provides you with a sharp focus that prevents you from becoming distracted and wasting away your time and energy. Your mission is the center of your life. If you don’t take time to define your personal mission and make no effort to coordinate your whole life, you might achieve your targets, but they’re scattered and don’t lead to larger objectives. Having a core purpose is like having a clear road map with a destination in view. As you continue along the road all shorter-term targets move you closer to your larger mission. As you move towards your major mission, with the connected objectives, each area of your life grows and is strengthened. Your core purpose lets you see what you are headed towards and why. It’s a useful for visualization exercise in achieving balance in your life. It can also let you know whether all areas of your life are proceeding as they should. Goals with a core purpose can help you combine all the aspects of your life and achieve your dream career. Continue reading how to create a personal mission statement here.